On this gentle, mindful walk on the verdant grounds of the Lyon Arboretum, you'll leave behind the stresses of the world and get in touch with the healing powers of the forest. As we move through about a mile of easy trail over the course of the approximately 3-hour experience, your certified forest therapy guide will offer a series of “invitations” to help you re-connect with nature through your senses. You'll get to try a tea from the forest and a healthy, locally-sourced snack. Forest therapy is an evidence-based practice inspired by the Japanese "shinrin-yoku" (roughly translates to "forest bathing"), now a global wellness movement. You'll meet your guide at the Visitor's Center of the Lyon Arboretum, a 200-acre nature preserve and rain forest at the back of Manoa Valley. The Arboretum is about a 15-minute drive from Waikiki; the City bus (Manoa #5 route) also stops half a mile away. The Visitor Center has restrooms and a gift shop. Your guide will provide mats to sit on, and walking sticks if requested in advance. After a brief introduction to the background of forest bathing and what to expect on the walk, we'll cross into the main grounds of the Arboretum and spend the next few hours walking, standing, or sitting in the shade of the forest canopy. Unlike a hike, there's no destination; and unlike a walk with a naturalist/docent, we won't be fixed on naming species. Instead, you'll be invited to tune in to your senses, to wander slowly, to find a deep attentiveness to your surroundings, and, if you'd like, to share what you are noticing with your fellow participants. 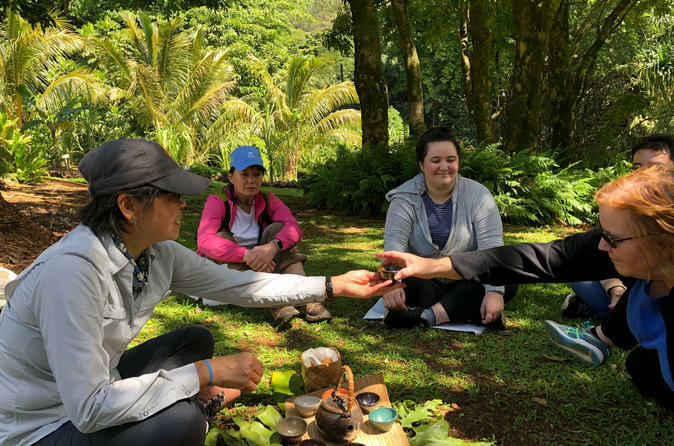 We'll end with an informal "tea ceremony," during which you'll get to try a tea and a snack made from some of the very trees you've been walking amidst. In this way, besides your memory of the time you spent in communion with nature, you will literally take some of the forest with you as you return (refreshed) to your life in the modern world.